For most people, getting to work at “The Happiest Place on Earth” would qualify as a dream job. And despite the odd restriction, like not being able to say these three words, feedback from former Disney parks employees pretty much confirms it to be true. But is there any job at Disney that’s not so enjoyable? Some might guess the worst job at Disney parks would be working in janitorial services. Who wants to clean up spilled drinks and vomit near amusement park rides all day? 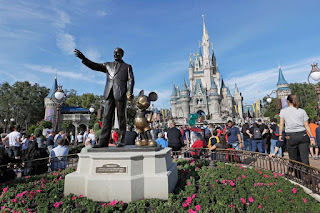 But on the contrary, former Disney staff say the freedom to roam the parks and interact with guests made custodial duties worthwhile to them. They enjoyed getting to witness and feel part of the magic around them—and interacting with park guests was a bonus. It’s actually the jobs where there’s not a lot of interaction with guests that “cast members” (Disney speak for staff) say were least enjoyable. One former Disney World employee divulges the worst job at Disney is working behind the scenes in the quick-service restaurants. These aren’t the staff that sit upfront and help guests place their fast-food orders. No, these are the folks preparing the food and handing people their orders. “Imagine working at McDonald’s, but all day is rush hour,” says a former employee. The work is repetitive and gets boring fast, she says. Plus, guests only notice you when you make a mistake, so your only interaction is placating the displeasure of “hangry” guests. “People usually choose to become cast members because they like interacting with guests,” says this former employee. “But this job gives only the shortest of interactions (and sometimes none at all).” In addition, cast members in these thankless jobs usually had to wear the same costumes as everyone else—while toiling away in food prep. If you’re going to work at Disney, according to these former cast members, character performers get treated like the princesses they’re dressed up to be, their attendants get to bask in the shared limelight, and you may even enjoy a sound technician role, if you don’t mind riding the same ride all day long, but the consensus is these are the very best jobs at Disney theme parks.